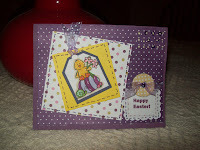 With Spring just outside the front door, it is time to do my Easter cards. These two cute little ducks are both from Elzybells and colored with Copics. 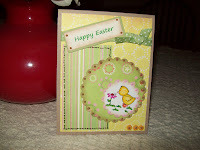 I used Papertrey's Bitty Dot basics and matching solid CS for the basis of the Duck on the Easter egg. I did not have a Happy Easter sentiment stamp, so I used my computer to print out the "Happy East". I set the main image at an angle on Papertrey's Polka Dot Parade in coordinating colors. Faux stiching ties it all together. For the second card, I used decorative papers I received as a freebie when I ordered some stamps (right now I can't remember from whom -- my old brain is just not working right now). Again the sentiment was done on my computer and set on dimensionals. I love the tiny buttons along the bottom. Hope you enjoy these entries. These are all so cute!!! !